. 1923 ~ Frederick A. Julliard set up a million-dollar fund to establish a music school. Today, Juilliard is one of the world’s leading music and dance schools.
. 1931 ~ Maurice Chevalier recorded Walkin’ My Baby Back Home for Victor Records in New York City. The same tune was recorded 21 years later by Nat ‘King’ Cole and Johnny Ray. 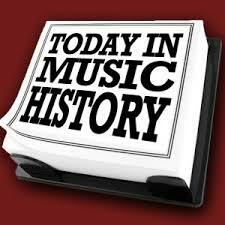 It became a major hit for both artists.
. 1956 ~ Elvis Presley entered the music charts for the first time. Heartbreak Hotel began its climb to the number one spot on the pop listing, reaching the top on April 11, 1956. It stayed at the top for eight weeks.
. 1958 ~ Roy Hamilton’s record, Don’t Let Go, became #13 in its first week on the record charts. The song was the first stereo record to make the pop music charts. 1958 was the year for several stereo recordings, including Hang Up My Rock and Roll Shoes by Chuck Willis, Yakety Yak by the Coasters, Born Too Late by The Poni-Tails, It’s All in the Game by Tommy Edwards and What Am I Living For by Chuck Willis.
. 1965 ~ Filming began for The Beatles’ second movie, “HELP!”, in the Bahamas.
. 1976 ~ Florence Ballard passed away. She was an American vocalist, one of the founding members of the popular Motown vocal group the Supremes. Ballard sang on sixteen top forty singles with the group, including ten number-one hits.
. 2001 ~ Ray Hendricks, a singer of the Big Band era who performed with Benny Goodman and Betty Grable, died at the age of 88. His career took him to Hollywood and across the country with stars including Goodman, Grable, Hoagy Carmichael, Ben Bernie, Ray Noble and Sid Lippman. His earliest performances were on Spokane radio station KFPY. He soon set out for California with Bob Crosby, brother of Bing Crosby. After serving as a flying instructor in the Air Force during World War II, he returned to Spokane and formed his own orchestra. He continued playing local venues for several decades, but said he regretted not pushing his career after the war.
. 2001 ~ Herbert Kupferberg, a music critic and a senior editor of Parade magazine, died at the age of 83. For more than 20 years, Kupferberg was an editor and critic for The New York Herald Tribune. After it folded in 1966, he joined Parade. He also wrote reviews for The Atlantic Monthly, and The National Observer. Kupferberg, born in New York in 1918, published several books including Amadeus: A Mozart Mosaic and Those Fabulous Philadelphians: The Life and Times of a Great Orchestra, a history of the Philadelphia Orchestra. This entry was posted in Composers, musicians, Pianists, Today in Music History and tagged Boy Scouts, composer, Elvis Presley, harpist, Julliard School of Music, Maurice Chevalier, music critic, Niels Wilhelm Gade, orchestra, Philadelphia Orchestra, pianist, singer, The Beatles, the Supremes, Today in Music History, video, Wolfgang Amadeus Mozart, Wolfgang Sawallisch. Bookmark the permalink.